We love that Austin has such a robust social season, don’t you? Celebrating this fall’s 62nd annual Jewel Ball, the Women’s Symphony League of Austin (WSL) recently announced their Royal Court participants at the Jewel Tea. The Court consists of a Diamond Queen and several Princesses from Austin, honoring the support of local families for the Austin Symphony Orchestra. 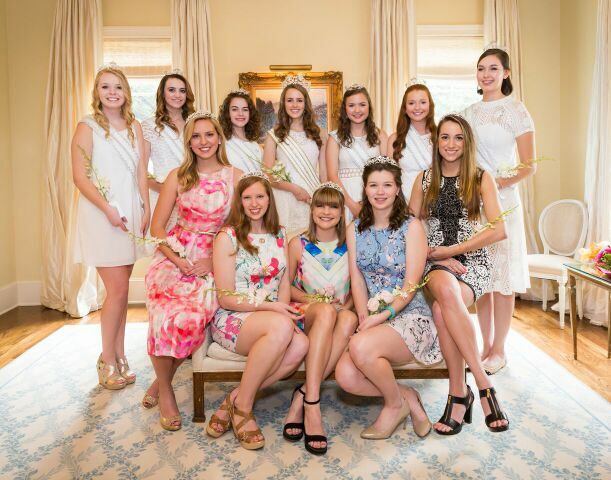 The WSL also invites outstanding, college-aged young women from across the state to represent their communities as members of the Visiting Jewel Court. Diamond Queen of the 2016 Royal Court, Queen Catherine Anne Powell, daughter of King Brio XLVIII and Mrs. Daniel Powell and escorted by Mr. Alex Gurasich, son of Mrs. Jill Carey and Mr. William Gurasich; Princess Audrey Sophia Abbott, daughter of Governor and Mrs. Greg Abbott and escorted by Mr. John Cowen Baizer, son of Knight and Mrs. David Baizer; Princess Monika Elizabeth Brinkmann, daughter of Knight and Mrs. Johannes Brinkmann and escorted by Mr. Samuel Maverick Hillhouse, son of Mr. and Mrs. George Hillhouse; Princess Madeline Elise Odom, daughter of Mr. and Mrs. Tres De La Paz and Mr. and Mrs. Eric Odom and escorted by Mr. Isaac Wells, son of Ms. Suzan Stewart and Mr. James Wells; Princess Alexandra Hudson Sherwood, daughter of Knight and Mrs. Taylor Sherwood and escorted by Mr. Sam Garrison, son of Mr. and Mrs. Daniel Garrison; Princess Luciana Christina Tiblier, daughter of Mrs. Susanne Tetzlaff and Knight Eric Tiblier and escorted by Mr. Miles Hirschfeld, son of Ms. Melanie Hirschfeld and Mr. Wendall Hirschfeld; and Princess Mary Hannah Eulon Wells, daughter of Ms. Suzan Stewart and Mr. James Wells, escorted by Mr. Boland Wegener Ross, son of Chancellor and Mrs. Beau Ross. Jewel Ball festivities begin this fall with the WSL Luncheon & Fashion Show, “Texas Women – Past, Present, & Future,” on Friday, September 23rd at the JW Marriott, chaired by Sharon Wilson and Tina Kemmerer. The WSL will proudly present a keynote discussion with famed designer Brandon Maxwell, the award-winning red carpet stylist and fashion designer from Longview, best known for his work with Lady Gaga. The Jewel Ball presentation and gala, “Stairway to Heaven” as its theme, will be at the Palmer Events Center on Saturday, September 24th where guests will be whisked away to a night of blissful fundraising, celebrating music and the Royal Court. Jewel Ball events this year are co-chaired by Barbara Crockett and Martha Bell Liner. The WSL also includes Austin teenagers in the festivities with their own dedicated event, the annual Soirée Dansante, a semi-formal fundraiser for teens from across the city. This year’s event, Soirádical 2016, will take place on September 4th, the Sunday of Labor Day Weekend, at the Brodie Homestead. Chairs for this year’s event are WSL members Stacey Brewer and Karen Temborius. For more information on the Jewel Ball, WSL Luncheon & Fashion Show and Soirádical 2016 visit www.wslaustin.org.